* These extraordinary Celtic style bridal earrings by Mariell feature pave Cubic Zirconia plated in silver rhodium. 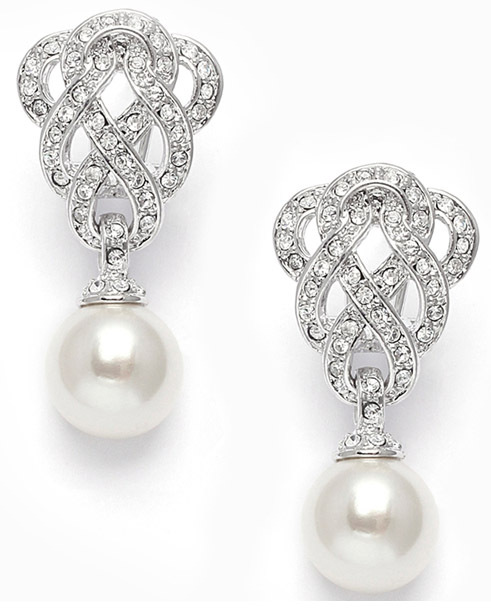 * Mariell's 1 1/8" h x 5/8" w wedding earrings have a Celtic style braided pave Cubic Zirconia top & 8mm soft cream pearl drops. * Our popular rhodium CZ earrings are ideal for brides, bridesmaids & mothers of the bride. * Also available in pierced (3831E).